Vegetarian comfort food because it's rough out there. 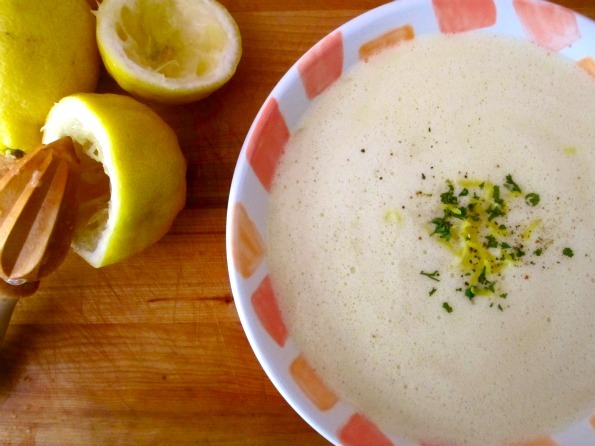 Confession: Prior to making this recipe, I never had tried avgolemono soup. The reasons: Back in my meat-eating youth, I suffered from a near paralyzing lack of Greek restaurants. I think it’s a common ailment for kids growing up in the middle of Wisconsin. Only cure: move. Move far away. And that I did. Well, OK, Minneapolis wasn’t that far away but it sure did have Greek restaurants. Of course, I was a card-carrying vegetarian by then and those delicious Greek restaurants seemed to really, really like putting chicken in this soup. So while I could get a slab of spanakopita the size of my head, avgolemono still wasn’t in the cards. Moral of the story: Somethings you just have to do yourself. And I’m glad I did. This soup is like nothing I ever tasted before! It’s fluffy! And light! And really tangy! I can see why it’s a favorite and why all my fellow dinners would ooo and aah over its deliciousness. It certainly made me happy! I can see whipping up (literally!) many a bowl this winter, when the sunlight is in short supply and hot, citrusy soup is exactly what’s called for. 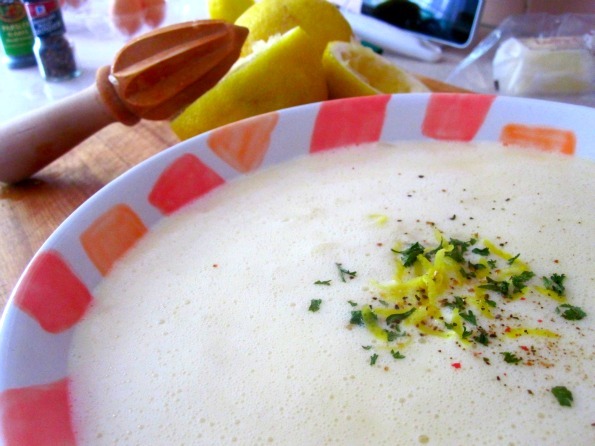 There are a lot of recipes for avgolemono – I chose to start with the most basic, figuring that would be the best place to get a feel for what was possible. Instead of chicken, I used garbanzo beans with the rice and it was perfect. I love lemony garbanzos and they added the heartiness and protein that skipping the chicken required. Important note: this soup doesn’t reheat. The lemon curdles and, well, ew. So reduce the recipe or have friends over because it’s a one-shot wonder and no one wants to throw away delicious soup. That’s like one of the saddest things in the world. So, OPA! and all that! Enjoy the soup! Make 4 big bowls of soup. Bring broth, rice and beans to a boil and simmer 20 minutes until rice is cooked. As you near the 20 minute mark, start whisking your egg whites. 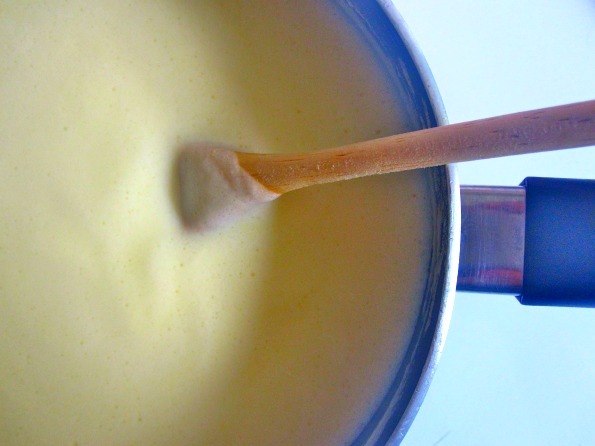 Once soft peaks form, whisk in egg yolks and lemon juice. Add a cup of hot broth to your egg mixture. Whisk. Add another cup of hot broth, whisk again. This is tempering the eggs so they don’t scramble upon meeting the hot liquid. Take the soup off the heat. Using a slow, steady stream, pour the tempered egg mix into the soup. Stirring constantly. Put the soup back in a low flame and bring to a simmer. Add pepper to taste. Garnish with minced parsley and lemon zest. This entry was written by haikugirl, posted on October 13, 2010 at 7:43 pm, filed under Beans and Legumes, Eggs, Rice and Other Grains, Soups. Bookmark the permalink. Follow any comments here with the RSS feed for this post. Post a comment or leave a trackback: Trackback URL. Oooh, I did a post on this about a year ago. It’s one of my favorite soups! Yours looks decidedly creamier than mine though. Mmm. It’s sooo good. I feel bad missing out on it all these years! It was good — more fluffy than creamy. Was yours more creamy than fluffy? Perhaps there is a soup out there with the perfect balance of both? Oh wow! this looks a.m.a.z.i.n.g!!! Two of my favourite things, chickpeas & lemon, in one luscious bowl of fluffy/creamy/soupy goodness… yum!!! thanks so much for sharing!! You went into SPAM — lame! I rescued you! You are not spam! Chickpeas are the best — and with lemon, even better!